Diwali the festival of lights is here and everyone is in a celebratory mood. Diwali celebrations vary from region to region but the most popularly believed myth is that on Lord Ram’s return from 14 years of banishment he was welcomed back by lighting diya’s(oil lamps). Diwali signifies the victory of good over evil – from darkness unto light. Pujas(act of worship) are performed to ward of evil, welcome good health and prosperity. It is celebrated by lighting diyas, sharing sweets with family and friends, exchanging gifts and lighting fireworks. This will be my first Diwali back home in nine years. I am definitely enjoying the sweets, and chocolates that we have been receiving since a week. Also this time of the year is auspicious for new beginnings so I am looking forward to beginning my job search in the next few days. The city this Diwali is playing host to US President Barrack Obama and First Lady Michelle Obama. Last year President Obama celebrated Diwali in the White House and this year he will be celebrating by lighting a diya with some school children at a school in South Bombay. In the last few days the media has been discussing how much the administration will be spending on security, luxury hotels and other logistics. It is believed that he will be travelling with about 3000 people including secret service agents, government officials and journalists. President Obama will definitely not be slumming but instead bringing prosperity to the people of India by spending $200 million a day on his four-day visit. With US warships guarding Bombay’s coast line and secret service personnel keeping a close watch on the city, Bombay has turned into a fortress. Many people have left the city to avoid random security checks and are traveling this Diwali. For those of us that are in the city I recommend making the most of it – welcome prosperity with open arms, embrace the 3000 visitors and very soon a new race of humankind shall emerge. 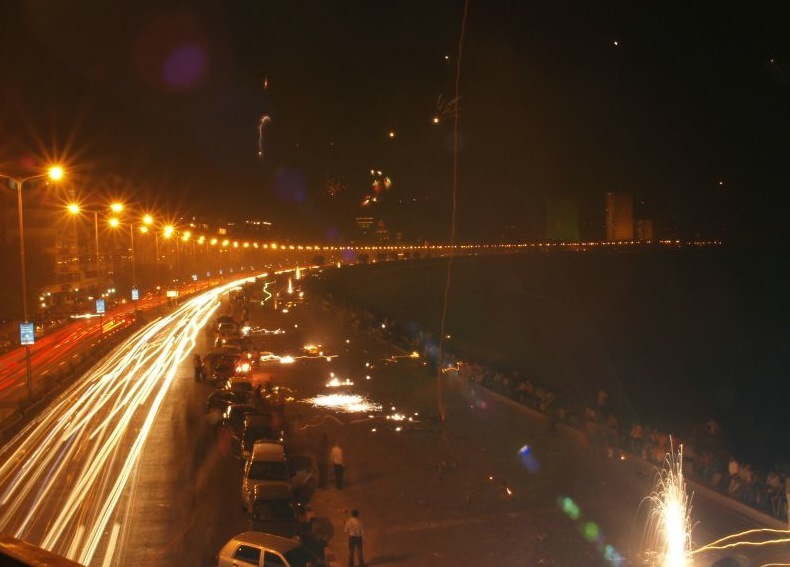 This entry was posted in Culture, Travel and tagged Bombay, Culture, Diwali, Festival, Indian, Mumbai, President Obama, Travel. Bookmark the permalink.